Get Wet Today – Immediate Start! When scuba divers think of Belize they often conjure up images of the barrier reef system, the largest in the Western hemisphere, or of the famous Great Belize Blue Hole and its aerial images, or of the Whale sharks that feed at Gladden Spit. Well now you can get to scuba dive the very best of what Belize has to offer with one of our more popular packages, the Belize Blue Hole and Whale Shark diving package. Splash Dive Center can customize your stay with a variety of accommodation providers in and around the beautiful village of Placencia or Hopkins during your stay in Southern Belize. Gladden Spit is famous for the majestic whale sharks that come at certain times of the year to feed and Splash Dive Center can offer you a high probability encounter with these creatures. 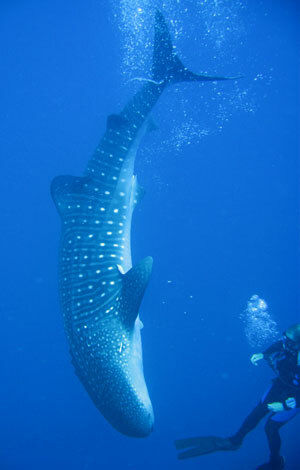 Your package includes two days of whale shark diving at Gladden Spit. You can read more on about our Whale shark dives and also about the famous Gladden Spit near Placencia in Southern Belize. These packages are a resort divers delight, and for accompanying non-divers we can offer Whale shark snorkeling trips as well. The famous Belize Blue Hole was immortalized by Jacques Cousteau in the Calypso, and you can read more about this world famous dive site on this page Great Blue hole, Belize. The Barrier Reef dives will be done at one of the magnificent marine reserves that Belize has established to protect and preserve its marine legacy. Rates are per person based on double occupancy, except as indicated, and are in US dollars. Our accommodations range from economical to the very best of high end luxury suites and apartments, but we recommend an early reservation as these resort diving packages and rooms are often booked up months in advance. Contact us for specific information, to discuss options and to arrange a reservation. This Is Why PlacenciaIs So Famous!